I LOVED If I Stay and can't wait for Where She Went! I'm yearning for it! I can't wait for this book! 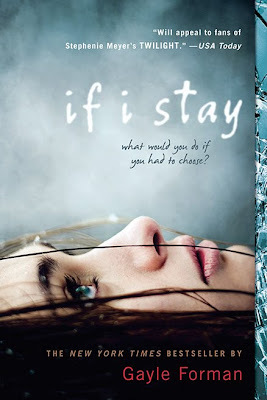 I LOVED If I Stay. I currently love listening to "The Only Exception" by Paramore. If I stay was amazing. There was not one page I did not cry while reading it. My current song is "Kings and Queens" by 30 Seconds to Mars. I just saw the cover at a couple of other blogs and I have to say it is gorgeous. My obssession song right now is Head over Heels by Tears for Fears. I don't have a blogspot account, but I'm so in love with If I Stay. I read it in less than a day and cried the entire time. My song obsession right now is "Chasing Corporate" by a band called Air Review. Yes! Another rockstar character to love. After Cole in Maggie Stiefvater's Linger, I needed a fix. Poor Adam though. Why did Mia leave?!?! I want Adam and Mia to be happily reunited. Gah these teasers are torture! I agree. Teasers are torture! My newest fav. song is Morning Light by The Dirty Heads. I also love Lay Me Down featuring Sublime. My current obsession is California Gurls by Katy Perry & Snoop Dog. My current obsession is Hate Me by Five Finger Death Punch. Thanks for the teaser and the great giveaway. This looks SO great! I love the covers!! California Gurls by Katy Perry and King of Anything by Sara Bereilles are my current song obsessions. Thank you so much for the teaser, i'm currently obsessed with "Your Arms Around Me" by Jens Lekman. I am so stoked for Where She Went! AHHH! My email is katieladybug8@aol.com and my current musical obsession is Don't Unplug Me by ALL CAPS! aw the "And if you think this has made Adam happy, you are very wrong." makes me want to read it sooner! I am so incredibly excited for this book! I absolutely love the song Beautiful, but Joydrop an obscure Canadian band from the 90s. My name's Shahira & I'm so excited for this contest!! This teaser tour is so much fun! My current obsessive song is "If I Had You" by Adam Lambert. I just love the lyrics. The video is pretty strange & his hair has got to go, but the song rocks! Oh my God, these teasers are killing me! I need to read the book! The song I'm obessing over right now is Little Lion Man by Mumford and Sons. It's a really great song, so checkit out if you're not familiar wiht it! If I stay is a great book - looking forward to the sequel.